Exoskeleton inventions made their first appearance around 2000, and have since developed into a distinct and growing area of human assistive technology, with consumer, medical, industrial, and military applications. To really grasp the scope and who’s who of the exoskeleton technology space, it can be helpful to look past fiction, puff, and press releases, and focus instead on data that reports actual patenting activity. Using “AcclaimIP,” a patent search and analytics service (http://www.acclaimip.com/), I have developed an overview of the exoskeleton space. The main search was made using the term “exoskeleton” in the “abstract” field. Some exoskeleton-relevant patents, however, may not actually use the term “exoskeleton.” I searched separately on Yoshiyuki Sankai of Tsukuba University (Japan) to capture his patent applications, which refer instead to “motion assistive devices.” I also searched separately on “exosuit” to capture relevant references from Harvard College and SRI. To streamline the search, I focused on US patents and published applications. The vast majority of foreign cases (i.e., non-US patent applications, such as those filed under the Patent Cooperation Treaty) have counterpart US applications. Thus their elimination does not affect the broad perspective provided by a US-based overview. Starting with the references accumulated by way of various search approaches, I deleted irrelevant references (e.g., references related to crustaceans, which actually pioneered exoskeleton technology). I also deleted published US patent applications that were later issued as patents. The end result was a set of 223 US patents and published applications, which I then used for graphical analytics, as provided by AcclaimIP. Charts 1 and 2 show respectively the top assignees and the most prolific inventors in the exoskeleton space. These two charts complement each other. For example, Homayoon Kazerooni (the most prolific inventor) has patents that are assigned variously to the University of California, Ekso Bionics, and US Bionics/SuitX (seen on the assignee chart). In time, exoskeleton patent applications will appear that are assigned to suitX, Kazerooni’s current company. Yoshiyuki Sankai (the second most prolific inventor) has patents that are assigned to both Tsukuba University and Cyberdyne (seen on the assignee chart). 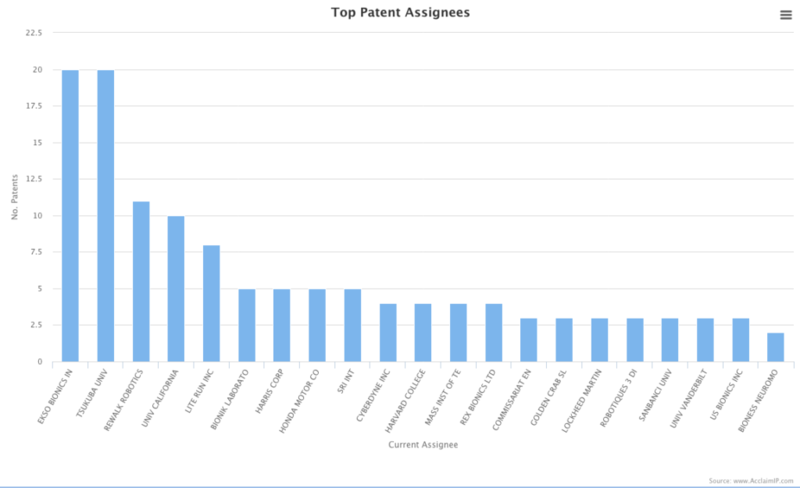 University and research institute representation are well represented on the full list of assignees; they own nearly 40% of the patents in the data list of 223 references. This makes sense in a field that is young and had its start in a research setting. 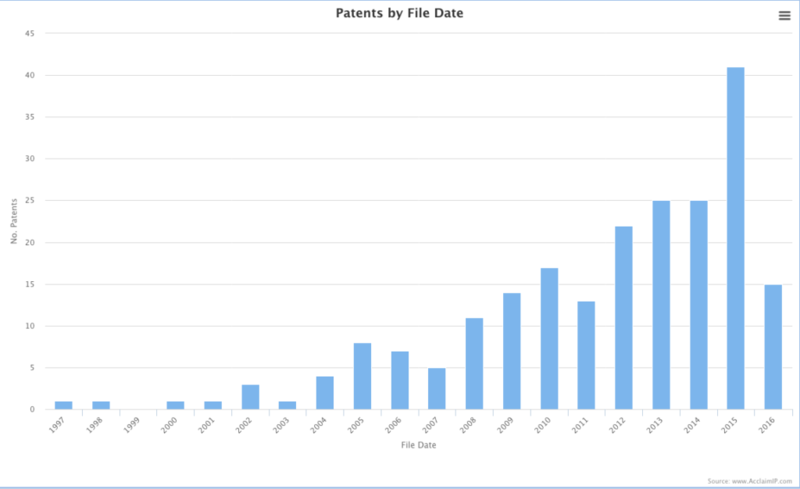 Chart 3 shows the number of patent applications filed in this space from 1997 to now (February 2017), with a steady growth phase beginning in about 2008. Applications take between 12 to 18 months to become publicly available; thus the 2016 patent filing data are incomplete, and will likely surpass the total for 2015. Another consequence of this delay in public availability is that the data shown in these charts lag behind the present actuality. As noted above, exosuit devices are included in the reported data (11 references). Assignees include Harvard College and SRI International (as seen on the Assignee chart), and OtherLab. 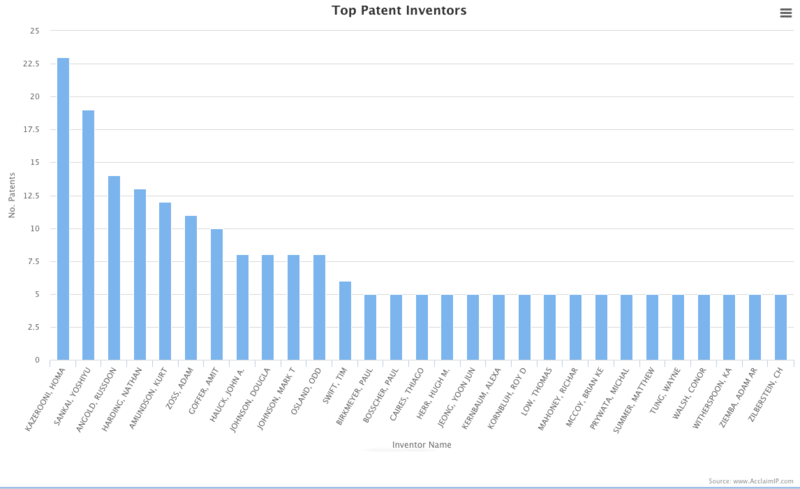 Harvard inventor, Conor Walsh, and SRI inventors Roy Kornbluh and Alexander Steele, can be seen on the inventor chart. The first exosuit patent was filed in 2013; this technology space will clearly be growing and may deserve its own set of charts within a few years. 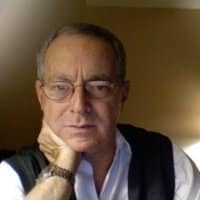 David Cohen is a registered patent agent in Oakland CA. He has a Ph.D. from UCSF, industrial experience in fermentation process development, and now focuses his patent practice in the medical device field. When is the Exoskeleton Industry Inflection Point and Where Are The Orders? I have a few general comments on searches on the field of exoskeletons and patents searches in particular. Having worked in the field since 2006 I am amazed by the pace it is starting to take. 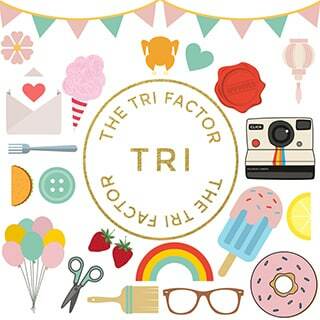 The feeling is that the last two years or so, the amount of information is getting larger than one have time to follow. As you noted in the head of the article it is not easy to find the right terms to capture patents in the search. The company I work with Bioservo Technologies filed our first patent in 2006 for what today would be called a soft exoskeleton. The name we put on the device was “Strengthening glove”. Exoskeleton is not mentioned in the abstract. Up to date we have filed ten patents in the field of soft exoskeleton (not all yet published in US or elsewhere) and I do not believe any of those have “exoskeleton” in the abstract. I do think your search also miss other players, such as NASA and GM from their work on the Roboglove. Korea tech also hold some patents in the field. The reason that we do not use the word “exoskeleton” for our soft devices is that there is nothing resembling a skeleton, our technology uses the existing human skeleton to handle the resulting forces. Further, skeleton draws the mind to something hard while it is not. Exosuit I like better, but it does not go well with a glove. We initially tried to set the acronym SEM for the technology meaing Soft Extra Muscles, but it does not stick and we have not used it in patents. I think a good name for the general technology yet has to be found. If there as such general name some of your results would look different, but I think that it in most parts would be the same, and the exponential growth of the field is definitely valid. Thank you for the great comment, Johan! I agree that “exoskeleton” is not the best term. The Exoskeleton Report team has done a lot of soul-searching on the subject. The first iteration of this website was called “Biomechatronics.net.” Biomechatronics was a term popularized by Hugh Herr from MIT, but like SEM, it just didn’t stick. “Wearables” is a bit too general as people think Fitbit and the likes. I am hoping that eventually we settle on a term, but for now we will have to go with exoskeleton, exosuit, soft exoskeleton, etc… similar to car, truck, big rig / semi-trailer truck, motorcycle, ATV which are all forms of powered wheeled ground vehicles. Thanking Dr. Ingvast for his generous and informative comments. By the time I had built out the reference list that underlies the charts in the article, I realized that it was insufficient to rely so heavily on “exoskeleton” as keyword. I decided to go ahead with the possibly incomplete information I had because I figured that it was a good start, and that collecting a larger data set would probably not significantly change the shape of apparent trends, particularly the chronological view. I also thought that I might hear from people in the field who would fill in some of the missing pieces. Search exercises can be humbling, as seemingly guaranteed common sense keywords often do not deliver the full picture (alas, shortcuts fall short). And it’s always instructive to understand the evolution, rationale, and quirks of terminology in a field, as exemplified by Dr. Ingvast’s comments. To get a highly granular view of the field, I would direct attention to the “Commercial Exoskeletons Catalog” table at the bottom of the Exoskeleton Report’s home page. Those table entries are actually links that call out players in each of those spaces. In a few months, I will take another swing at this patent landscape project, and include a table that will provide further detail. What Is happening with the unpowered ankle exoskeleton (Sawicki et al)? I can’t find anything about it after late 2015, not even in Sawicki’s publications list. As an “aging baby boomer” who wants to continue backpacking at a level where I can get where I want to go in a reasonable time, I hope this, or a similar device, goes commercial, even if very expensive, before it is too late for me. ab2: I think you should just track down Greg Sawicki by email or telephone and ask him what the story is. He’s at the University of North Carolina at Chapel Hill, a professor of Biomedical Engineering and the Director of the Human Powerlab.